Learn to develop support systems and utilize privileged communications. Discuss crew resource behavior management, teamwork, role clarification, communication styles and tips. Develop strategies to promote safety, security and dignity for all involved. Review common head and neck emergencies. Discuss treatment options for these emergencies. Describe procedures to treat head and neck complaints. Discuss the 5 generations encountered in the workplace and their characteristics. Describe the interactions between generations and its effect on the workplace environment. Discuss current statistics on Discouraged Doctors, the individual and group dynamics causing workplace stress and strategies to find meaning in our work. 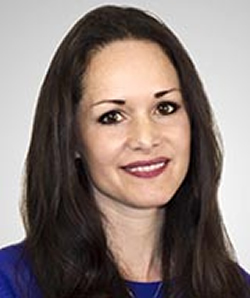 Dr. Tara Dall is a board certified lipidologist with roots in family medicine and training at the University of Wisconsin Madison. She has spent the last 15 years using advanced biomarker testing in the clinical care of patients. She graduated in the inaugural class of Diplomates of the American Board of Clinical Lipidology in 2005. Her center achieved national recognition as the first fully certified Level II lipid clinic in the United States. In 2008, Dr. Dall formed the Early Detection Center for heart disease and diabetes near Madison, Wisconsin and served as a clinical associate professor for the Medical College of Wisconsin. Two years later, she brought her fight against heart disease to the web, co-founding Lecturepad.org and FHITtv.org, web platforms that advance clinical understanding and application of advanced lipid and biomarker testing. For 3 years Dr. Dall served as Chief Medical Officer of Health Diagnostic Laboratory. As an author and educator on biomarker research focused on the role that insulin resistance plays in diabetes prevention she has expanded the education of physicians to prevent chronic disease. She has a special interest in insulin resistance's role in cardiovascular disease, women's heart disease, Autoimmune disease, polycystic ovarian syndrome, and obesity. She also serves as chief of cardiometabolic education at the non-profit Foundation for Health Improvement and Technology (FHIT). Known for her passionate delivery of complex medical topics in patient-friendly terms, Dr. Dall is a sought after speaker, traveling the world to present research on advanced biomarkers. She is a also a regular go-to for reporters, appearing on Bloomberg News, CBS Sports, CNN Radio, Reach MD Satellite Radio, and RadioHealth Journal. She was also a regular guest on KTXD-TV's The Broadcast in Dallas, as well as programs on wabcradio.com (Optimal wellness and Forever Young). She continues to practice medicine as a physician founder of AvanceMD Concierge in Richmond, VA which incorporates cutting edge web based technology to the human touch of medicine, providing services to local as well as national and international clients. Dr. Sanson is an Emergency Physician with more than 20 years of experience in emergency medicine education, emergency department management, and leadership. She is a consultant and educator on Leadership development and Medical education, TracySansonMD, LLC and Associate Professor of Emergency Medicine @ University of Central Florida (UCF), College of Medicine. Dr. Sanson has served in several and varied leadership positions with the Society for Academic Emergency Medicine (SAEM), the Council of Residency Directors (CORD), and the American College of Emergency Physicians (ACEP). She is a member of the ACEP Speaker's Bureau and the 911 network. She has been a member of the ACEP faculty for many years, including the ACEP Teaching Fellowship and the Emergency Department Directors Academy. Dr. Sanson completed her medical degree and residency training at the University of Illinois at Chicago. She has held director positions in the US Air Force, the University of South Florida and TeamHealth during the past 20 years. 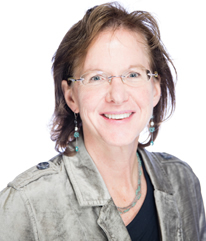 Dr. Sanson heads her own consulting firm, specializing in leadership training. St. Petersburg, Russia - In Peter the Great's "Window on Europe", head for the fabulous Hermitage, with its renowned art collection from Raphael to Rembrandt, Titian to Tintoretto. Take in a concert--folkloric or grandly operatic. *Visas are included with most shore excursions. If you wish to explore St. Petersburg on your own, however, a visa will be required; obtaining one can take some time, so please begin the visa process immediately. Helsinki, Finland - Shaped by its bays and isles, it's one of Europe's most scenic capitals. Hear a Sibelius concert, tour across the Arctic Circle to Lapland, land of Santa Claus, reindeer and the Midnight Sun. Buy a birchbark basket. Tallinn, Estonia - Medieval walls and towers still stand tall in Old Town. Stroll and shop along cobblestone streets, walk up to the Baroque palace, drop in at Alexander Nevsky Cathedral to find inspiration in the gleaming mosaics and icons. Visby, Sweden - In this delightful island town, stroll wide sandy beaches and cobbled streets lined with fairytale cottages. Walk the medieval city walls. Visit Bronze Age burial sites. Weary? Revive yourself with an icy aquavit. 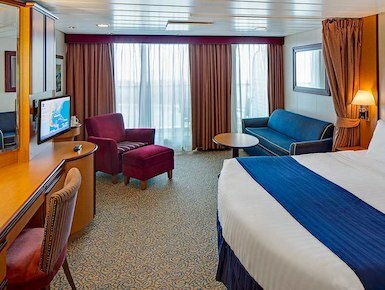 Two twin beds that convert to Royal King, private balcony, sitting area with sofa bed and private bathroom with tub. 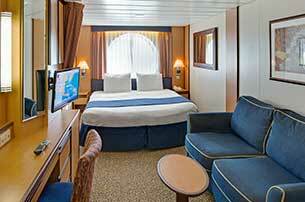 Stateroom: 299 sq. ft. Balcony: 41 sq. 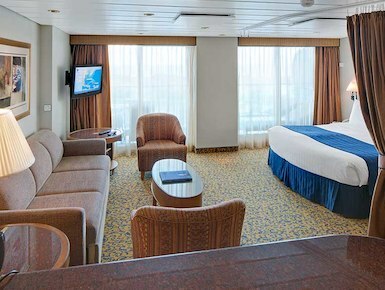 ft.
Two twin beds that convert to Royal King, private balcony, sitting area with double sofa bed. Bathroom with tub and double sink. Concierge service. 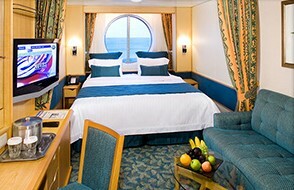 Stateroom: 385 sq. ft. Balcony: 106 sq. ft.
Queen-sided bed, bathroom with whirlpool tub, double sink and bidet. Separate living area with a double sofa bed. 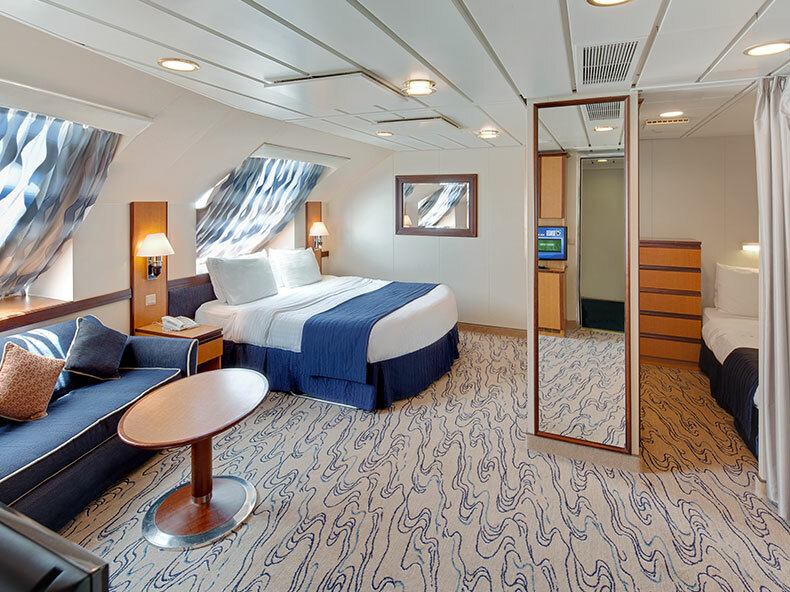 Stateroom: 512 sq. ft. Balcony 57 sq. ft.
Two bedrooms with two twin beds that convert to Royal King (one room with third and fourth Pullman beds), two bathrooms (one with shower, one with bathtub), living area with double sofa bed, private balcony, and concierge service. 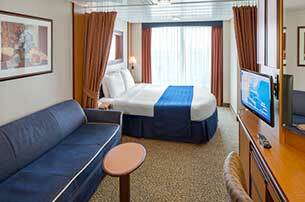 Stateroom: 584 sq. ft. Balcony: 151 sq. ft. Bedroom with king-size bed, and private bathroom with tub, double sink and bidet. Private balcony, living room with queen-size sofa bed and baby grand piano. 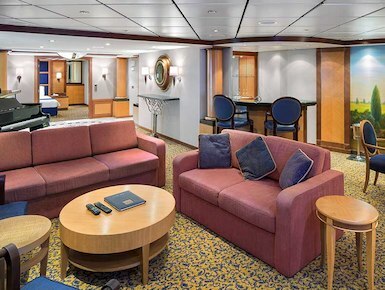 Stateroom: 1,101 sq. ft. Balcony: 106 sq. ft.
Two bedrooms. Master has two twin beds that convert to Royal King and bathroom with tub. Additional bedroom with twin bed and two Pullman beds. Living room with double sofabed and second bathroom with shower. 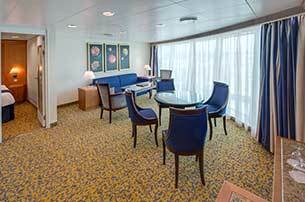 Stateroom: 584 sq. 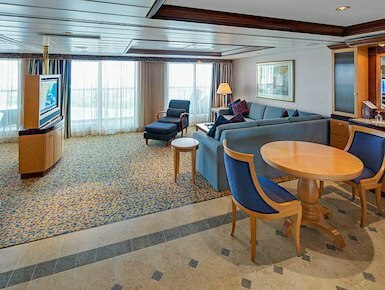 ft.
Two twin beds that convert to Royal King, sitting area, private balcony and bathroom. 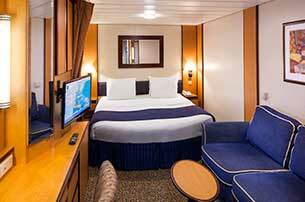 Stateroom: 179 sq. ft. Balcony: 20 sq. ft.
Two twin beds that convert to Royal King and private bathroom. 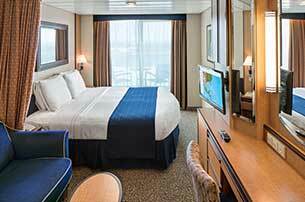 Stateroom: 155 sq. 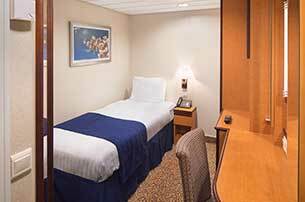 ft.
Two twin beds that convert to Royal King, additional bunk beds in separate area, separate sitting area with sofa bed, and private bathroom with shower. 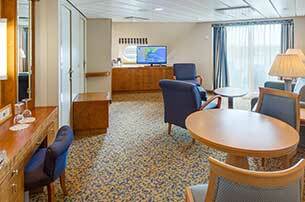 Stateroom: 265 sq. ft.